As thousands gather in Washington, D.C., next week to join Pope Francis at a mass to canonize 18th century Spanish missionary Father Junipero Serra, the choir and congregants will be singing liturgical music composed especially for the occasion by an Emory graduate student. To those who know his work, it may not come as a complete surprise that Emory PhD student Tony Alonso was commissioned to compose original music as part of the pontiff's first visit to the U.S., which marks the first canonization of a saint to ever take place in this country. At 35, Alonso is considered among the nation's most prominent and prolific voices in the realm of contemporary liturgical music. To date, he's published about 200 liturgical songs, which appear in musical collections and hymnals worldwide. Yet when the invitation came to compose music for Psalm 96, "Proclaim His Marvelous Deeds/Cuenten las Maravillas del Señor," a responsorial psalm to be sung by a choir, cantor and congregation between the first and second readings at the pope's special mass, Alonso was stunned. "I stood in disbelief for about 10 minutes," recalls Alonso, who is entering his fourth year in the Laney Graduate School's Graduate Division of Religion with a focus on studies in Candler School of Theology. Initially, Alonso was asked not to speak about the commission, pending final approvals. Adding to the pressure was a tight timeline. The invitation arrived in late-April and the committee wanted music in hand by mid-June to begin rehearsals. Normally, Alonso is provided six months to a year for musical commissions. In this case, he happily made an exception. "At first, I felt a degree of panic," he admits. "But at the same time, I was both honored and deeply touched." "My father is from Cuba," Alonso explains. "To be composing something for the first Latin American pope — who, ironically, will be visiting Cuba before he makes his first visit to the United States, where he will be celebrating a mass in Spanish — touches me on an especially personal level." Next Wednesday's mass outside the Basilica of the National Shrine of the Immaculate Conception in Washington, D.C., is one of three public masses Pope Francis is scheduled to celebrate during his U.S. visit. Later stops include New York City and Philadelphia. Alonso was working at Loyola Marymount University in Los Angeles — where he earned a master's degree in theology —when he came to know more about both the life's work and controversy surrounding Serra, a Franciscan theologian who helped establish nine Catholic missions along the California coast. Some view Serra as a pivotal force in shaping California's educational, spiritual and cultural foundation. Others assert that by helping convert thousands of Native Americans to Catholicism, he contributed to a system that destroyed indigenous culture. "The canonization is being received in a mixed way by Roman Catholics and non-Roman Catholics alike," Alonso acknowledges. "My own thought is that the visit of Pope Francis will overshadow that. That's why I deliberately tried to reflect a variety of musical styles in my composition." "The first thing I wanted to think about was the very specific nature of the mass, the canonization of Junipero Serra, an 18th century Spanish Franciscan friar," he says. "So I began thinking about things the native peoples would have sung when he first arrived in California — that became a driving force. "Through my composition, I wanted to honor the indigenous people both prior to and after Serra's arrival," he adds. Alonso drew upon the expertise of colleagues and friends who have researched the music of early California missions, which he describes as "a complex mix of folk music by indigenous people and Spanish music brought over by the Franciscans." Hours at the piano, as well as time away from the instrument — walking to school, Alonso often sings a melody out loud — helped him create the resulting four-minute composition, which contains both English and Spanish-language lyrics, as the committee requested. "No pope has celebrated mass before in the U.S. in Spanish — the primary language on my father's side of the family — which made it even more exciting for me," he says. In the final piece, the indigenous influence will be heard primarily in rhythms. "It's mixed-meter, a dance-like, changing meter," Alonso says. "In Western music, we tend to hear more of a constant pulse. There's more subtlety to this, because the music that would have been sung in early California missions would have been an interesting mix of the complex and simple, often accompanied only by a guitar or drum." "My composition tries to acknowledge that influence, but also reflect the gravitas of a papal mass," he adds. Alonso jokes that musical talent skipped a generation in his family. Though neither of his parents claims any special skill, he vividly recalls his grandmother and aunts exuberantly singing at family gatherings, he says. Being raised in the Roman Catholic Church provided an early introduction to liturgical music. "My fourth grade teacher asked me to sing at church once and the rest is history," he explains. As an undergraduate, Alonso attended Northwestern University in Chicago, where he studied choral conducting and played the piano at a local church, which nurtured his early composing career. When he couldn't find a setting for a psalm that he liked for a liturgy, Alonso simply wrote his own. "Like many things in the church, you are often called upon to do things when there is no one else to do it," he says. Today, in addition to his studies, Alonso also maintains an active composing life. "Student by day, composer by night," he quips. "When I'm writing music for a church, I find that I'm trying to express a community's faith experience — trying to write something that the whole community can see themselves in," he says. "In that way, composing for the church can mean a lot of different things, depending on the occasion and the community you are writing for — I enjoy that challenge." 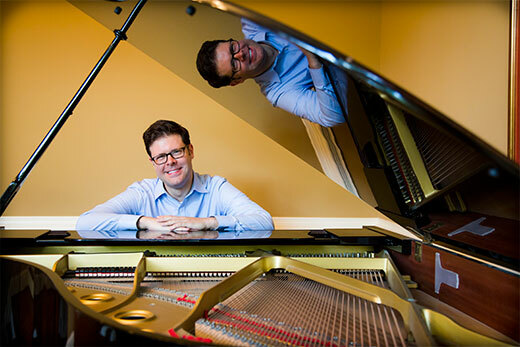 Even as Alonso prepares to join 25,000 congregants at next week's mass, he is putting the final touches on his Emory dissertation proposal — which surprisingly has nothing to do with composing music for a papal canonization mass. "I know, shouldn't that count as a dissertation?" he jokes. "Actually, my primary research interest is the relationship between liturgy, ethics and culture. My hope is to teach theology and continue to compose and write music." Alonso says he was drawn to Emory for doctoral studies primarily for "the opportunity to study with (theologian-in-residence) Professor Don Saliers, who though retired, was willing to take me on as a student — along with the benefits of working with an overall stellar faculty." Saliers, William R. Cannon Distinguished Professor of Theology and Worship, Emeritus, was delighted to see Alonso seize the challenge of composing music for a groundbreaking papal mass. "It's a one-of-a-kind opportunity for someone of Tony's sensibilities and abilities," he says. "He's one of these unusual talents who has brilliant intellectual capabilities and is instinctually a very fine theologian," Saliers adds. "But he's also a very talented musician — a composer widely known throughout the Catholic community around America, a popular collaborator, and a wonderful cantor and singer. "This opportunity he has is very special," he says. "It's really serendipity, or if you are theological, you might call it providential."